As a self-published author, one of the topics that interests me is how people market their products. Last week I received a free copy of Josh Turner’s, Booked to preview. Inside the book there are links to a companion video series the reader can access free of charge. Position yourself in front of your prospects. Convert a percentage of these prospects into leads and appointments. Turn at least one of them into a client. Josh admits most people already know this information, but he claims the problem is people don’t spend enough time on steps one and two in order to be successful at step three. After the introduction, Josh shares the story of how his father built up a remodelling business, which was successful for many years, bringing in up to $1 million. However, the business eventually shut down because of a lack of clients. Josh joined a construction company, which did about $5 million in revenue, but in 2008, that company also shut down because the income didn’t cover the expenses. 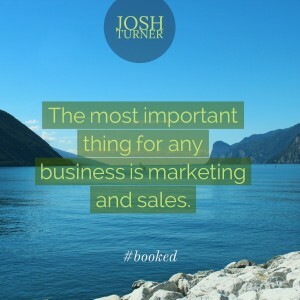 Click here for more information from Josh Turner and his Booked system. I appreciate Josh Turner’s reminders that this system requires work. Obviously he is hoping to engage readers and have them purchase his system. Have you tried the booked system or something similar? How effective did you find it?